Hello i am trying to develop an app as a project for school. I ran to a problem. I was greeted with this. After google searching here is what i found out. It would seem that google has stopped support of openSSL (the one responsible for httprequests) on android 7 + . So again i went to googling for solutions and stumbled into an official documentation form Qt on how to solve this. Now again more problems, It would seem that for me to do it is to use a Linux based OS, which i dont have. So hence the Title. 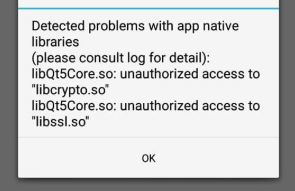 Is there anyway for me Using QT running on a WINDOWS operating system to add openSSL support to my android application? I have read somewhere that i can just Build Android APK > Additional Libraries > Add , but i do not know which files and the locations of the correct files. A best way it is to compile OpenSSL yourself. F.e. it can "simple" to do using Linux host. Just install the Linux (with Android NDK ) on a VirtualMachine and compile the OpenSSL there, and then just take a resulting binaries to use for Windows host. PS: Also, as an option, you can download pre-compiled OpenSSL binaries (please search in a Google), but is ia a most worse case. Okay, i have zero experience in linux so bear with me please, can you give me a step by step guide on how to do the compiling of OpenSSL. i think i can do the downloading and installing of qt and android NDK on my own. installing of qt and android NDK on my own. Qt is not need in this case. You need only in NDK (just download it and unpack). @Pablo-J.-Rogina I got lost in "Build OpenSsl" ./configure says directory not found. where should i run these comands?